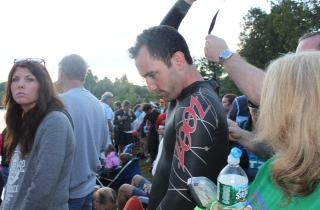 Well that day I decided on doing a sprint tri. I knew I had to learn how to swim and the next month I started in a pool by myself. I couldn’t even swim to the wall and back. I started watching YouTube videos and using them to learn how to swim and I would go to the pool and pick up tips from people. And then I kind of taught myself to swim in the lap pool. 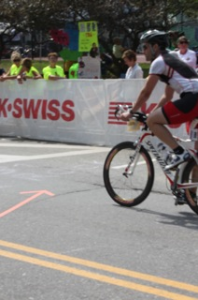 Then I bought a bike and did my first sprint triathlon. How long was it in between watching the ABC program until actually doing a sprint triathlon? Wow, so you decided then and there to do this. I want to say that it aired in November/December, and I did my first sprint in May of the following year so I had like 6 or 7 months. But I remember I started swimming in January in the wintertime in an indoor pool and then I got a bike in April and I trained on the bike for about 4 weeks and then I did the NYC Triathlon. That’s also when I proposed to my wife. I thought, if I finish this big feat then I am definitely proposing. After the NYC Triathlon I kind of got addicted and I thought, “You know what? 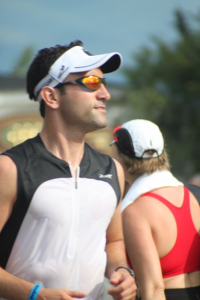 I want to push myself a little bit more and see what my limits are,” and I decided to sign up to do a half Ironman. I did that last year in October. So every year you’ve been inching toward the Ironman? Yes, I’ve been increasing the intensity every year. After the half Ironman I thought, “I am done. That was ridiculous.” I was so proud of myself for having done it at all and I really thought I had reached my limit. The next thing you know, come December of last year, I’m watching the Ironman special on TV and I’m bawling and I’m like, “You know what? These people can do it; I know I can do this. I gotta do this. I just gotta sign up.” So I went online, signed up in December and said, “Alright, now that I’ve signed up I actually gotta do this.” So I went and got the training book, a 6 month program that tells you day by day what to do. And I followed it and I decided to give it a go and that’s what happened. Was there any point during the Ironman that you thought you wouldn’t be able to go on? So I woke up Saturday, got breakfast, was feeling better, walked into town again, and started getting nauseous again. I set up my bike because you have to do it all the day before, and we went to this dinner with all of the athletes where they were talking about the Ironman and how monumental it is and how rigorous it is. Everyone shared their stories and I sat there getting really nervous and really excited at the same time. Going to bed that night, I thought, “I don’t think I can do this, I don’t think I’m prepared.” So I took an Ambien and went to bed. I woke up the next morning and 2:15 in the morning. Are you supposed to wake up that early? Did you swim over someone? Oh yeah! Imagine like 2500 people in this little area, just swimming. Its nuts! Everybody’s punching everyone. So I do a 2.4 mile swim and I’m getting elbowed in the face, and it’s funny, as soon as the canon went off I had this calm over me and I just knew what I had to do. You were in the zone. Yeah, I’m in the zone now and you get out of the swim and you run to the bikes and there are thousands of people cheering you on. My family had these big signs and I ran over and gave them a kiss and then started the two 56 mile loops. I’m drinking all my Gatorades and eating all my gel packs. And usually the bike is my weakest event so I took it nice and easy and once I finished the first lap I knew I was going to finish the race. I just knew I was going to finish. And that’s when I kind of really settled in. I finished the second lap and then I got off the bike, my legs felt good. But I drank so many of the Gatorades and these gels that I had kind of an upset stomach when I started the marathon. I didn’t really eat too much food during the run, just drank a lot of water and took a lot of salt pills, had a couple of grapes, had one or two pretzels, and pretty much jogged as much as I could of the marathon and walked when I needed to. Then the last 2 miles, you just feel like a million bucks. You round the last turn and you go into the stadium and it’s this guy Mike Riley, he’s the voice of the Ironman, and you hear him announcing everybody’s name. Everybody goes in one by one and you run into the Olympic oval for the last quarter mile and there are thousands people watching you going in. Then he says, “Ryan Kitzen you are an Ironman” and you cross the finish line and then you go nuts!